Products / Lent Super Box 2019: Packed with daily, weekly, and monthly materials! Lent Super Box 2019: Packed with daily, weekly, and monthly materials! Deepen your journey through Lent along with us using crafts, books, magazines, activities, games, and videos designed to engage kids aged 4-8! 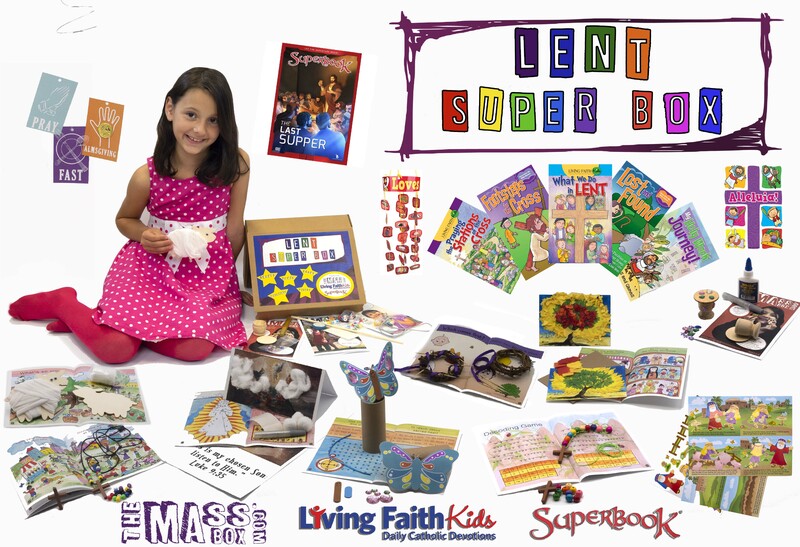 This Super Box gets kids ready for each Mass in Lent with 10 individually packaged crafts, Mass companion magazines, and webisodes themed to every Sunday from the First Sunday of Lent to Easter Sunday, Ash Wednesday, and Holy Week from The Mass Box; 5 activity books, a Lent Mobile, and an Easter Magnet game from Living Faith Kids; and The Last Supper DVD from SuperBook. All in one box you’ll have daily, weekly, and monthly activities.